This week something happened to me and I cannot ignore it. I met a man with x-ray vision! Yes, that’s right Superwoman met Superman. He used his x-ray vision to see straight through me! I was naked figuratively within two hours. How does that happen? It happened while talking. I was having a great conversation when boom out of nowhere his x-ray vision spotted my secret weapon, my strength. I was asked a simple question: Why are you not married? I was caught completely off guard. I laughed because I could only laugh. What do you do when someone touches on that secret question you had been asking yourself the Sunday before the phone call. As a matter of fact, I have been asking myself the question for a couple of years. Not only did he ask the question, he gave me his answer to his question. He simply said, “You are a strong woman.” My reply, “How did you know that I was strong?” In that conversation, I was not spitting out my crazy rhetoric. I was not running a meeting. I was not saying, “I do not tolerate this or that”. I was just talking about something we both share a common interest. I was shocked that he knew my KRYPTONITE. Yes, being a strong woman to some men is not appealing. They love your ability to get things done and to take charge, but they also want you to ALLOW them to be the man in a relationship and to respect them in their role. He said he could hear my strength via my conversation. Then he asked another question that indicated he also had the ability to cut right through my stuff. He asked, “Can you take your cape off when you enter into a relationship with a man? At this point, I am rolling my eyes up and in my head and asking myself if I should I answer truthfully or tell him what I KNOW he wants to hear. I decided to shoot straight. My secret cover was blown. I said, “Yes! I can take my cape off when I hit the door.” What he did not know was my cape was barely hanging on my body. Being Superwoman, Bat Girl, and Wonder Woman is tiring! I am tired of blocking all of the unfair, disrespectful obstacles that come my way on a daily basis as a businesswoman, a mother, a single woman, a black woman, and as a friend. Some days I feel overwhelmed with fear and concern for my financial future. Sometimes I feel lonely. I listen to folks in bad marriages and on some days I think at least you have someone. That thought flees quickly because I would rather be single than married and miserable. Then, I put my cape back on and get back on my grind and say to myself: Don’t Settle! There are days when I am wondering how am I going to meet my budget for the month and I ask myself where is the man who will rescue me? Then, I admit he does not exist; then, I put on my cape and carry on like business as usual. The last thing he said floored me. He said, “You are the type of woman who will look at me when I say something you do not like and challenge me.” I laughed so hard at his summation of my behavior. He was RIGHT! I have had to really work hard for the last year to truly understand men MUST be treated with RESPECT and KINDNESS. I know how to respect men. I talk with men all the time. I am friends with several strong men, but I have not always treated the men I loved with the level of respect they deserve. I have not always allowed them to have the last word. I have wasted too much energy trying to tell a man he must respect me instead of quickly leaving him when he does not. I have stood up to controlling men and lost my control in the mist of the battle. I have used my strength to help build up my men, while they have spent too much time trying to figure how to decrease my strength. When women spend too much time trying to please the wrong men, they lose respect for all men. My greatest downfall was partnering with men that needed my strength and utility to maintain, but they could not stand my inner strength. Free-spirited, strong women work best when they are given the ability to soar. We need our capes to soar! It has taken me two years to get my Superwoman outfit on straight. I understand the power that I have as a woman is not to have the last say, to defend myself at all cost, to run towards drama, to create discontent in my home, and to make a man feel like he is the “woman” in a relationship. My mission in life as Superwoman with flaws is to ask more questions while getting to know a man. If he has flaws that I cannot live with, then I should maintain the friendship and immediately disengage a relationship. When I feel the need to say something hurtful, shut my mouth and walk or run away if necessary. I must maintain PEACE in all my relationship. Finally, as Superwoman carrying my cape with flaws, I can be VULNERABLE anytime and anywhere. Like most superheroes, I have secret powers too. I am using my wisdom, my critical thinking skills, my passion, my kindness to build men up and to encourage them. I too can see men’s strengths and some of their weaknesses. I have decided to accept them for who they say they are. I am being honest and I am listening. I am on a mission to teach other Superwomen to listen to men when they talk to us about us. I am not ashamed to say, I needed to work on me before getting married. I have embraced the fact that not all men can handle a strong woman. I am strong and that will not change. However, I can take my cape off and gladly let a man step up and make decisions. I will always use my influence to shape those decisions. I gladly welcome the man who can see my strength, see my beauty, respect my intelligence, and recognize my flaws, and still build and love me. I am rare individual: I am Superwoman with flaws. Doing God’s work does not go unnoticed. Today, I was moved to tears when Ms. Wallace, age 64, shared her testimony while sitting in my Traverse. Ms. Johnson (bottom photo), 83 and my play grandmother, moved to the nursing home after she almost died on several occasions in her hot house in Acres Homes. She only had one A.C. window unit in the 20 plus years she stayed in the rent house on Maxroy. 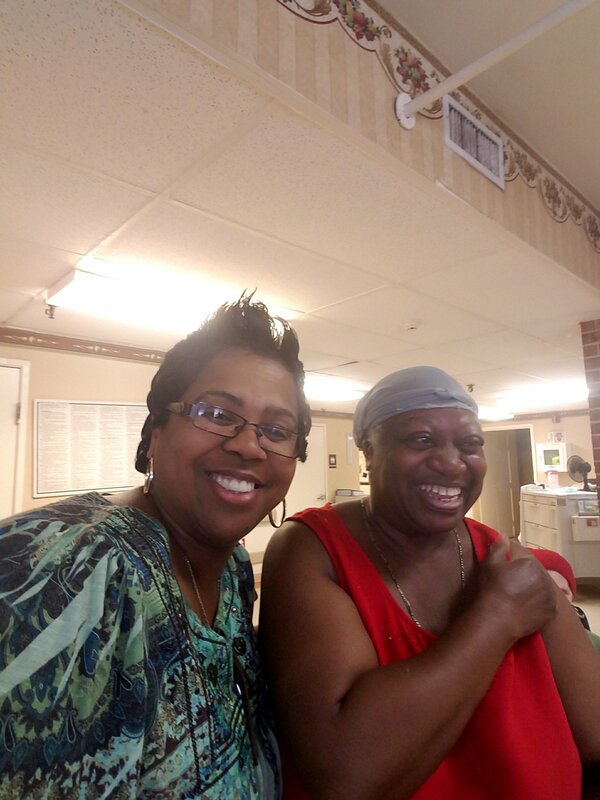 Today, Ms. Johnson lives in a Westhaven Residential with central air and heat and around the clock medical care. She has been safe and happy for two years. My mind has been at peace too. Ms. Wallace is legally blind and currently living in a hot house without central air in Acres Home. In June, after visiting the nursing home with me, Ms. Wallace passed out and was hospitalized. I have been trying to get Ms. Wallace to move for two years. Last month, she heard a snake crawing around in the walls. The snake catcher came but could not catch the snake. I feared for her safety. She often burns or undercooks her food because she cannot see what she is doing. Today, she stated that she was finally ready to move. We praised God in the SUV for her “Greater.” I thanked God for “my greater!” She shared her testimony and I cried like a baby. Luckily, she could not see me. We forget some senior citizens do not have central air and heat. She said she almost froze to death in January because she only has a floor heater. I went to help Ms. Wallace today, but she helped me instead. She moved me and touched my heart with her words and her testimony. She reminded me of how important it is to obey God and do what He asked even when I do not want to do it. She reminded me of how good God has been to me. More importantly, she reminded me that she “saw” my efforts to help her as a blessing; she reminded me of the fact that I have helped her and Ms. Johnson for over 20 years; she reminded me that God called me to help my adopted children; she reminded me that I never charged them for helping them; she reminded me that I did not have to help them! 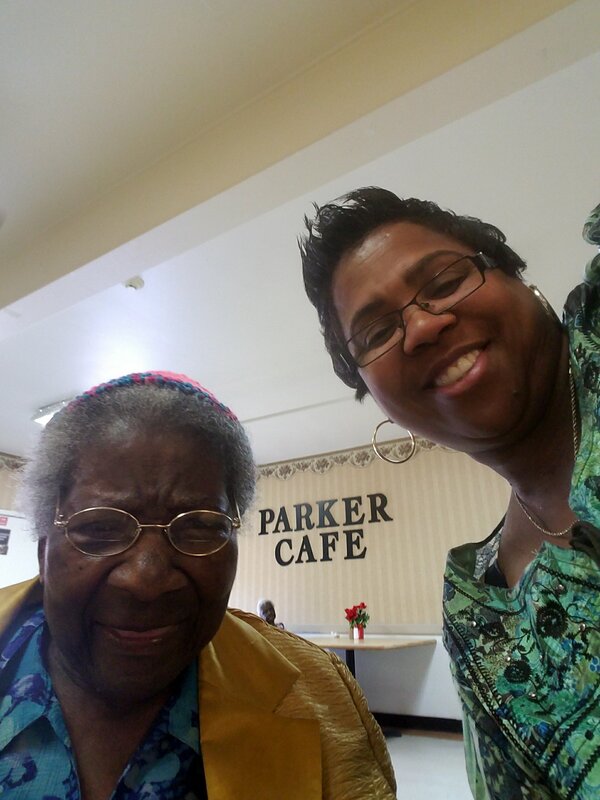 She reminded me that I loved and respected little old ladies because of a special senior citizen I had in my life named Mrs. Zeffie Frazier (referred to as Muh). Muh practically raised me while my parents worked. I sat with Muh and laughed, ate any and everything, cried too much, learned to tell time, pick eggs out of the chicken coop, walked in hot tar, and watched The Edge of Night and The Price is Right. When I turned 16, I got my first job while staying with Muh for the summer. I had my first boyfriend visit from out of town at Muh’s. I drove Muh and Alice to the fish creek. I picked-up Muh’s spit cup and brought her Bitter Garrett’s snuff so much that I never wanted to try dipping! I have a special place in my heart for senior citizens thanks to Zeffie Frazier’ s love for me. She treated me like I was special. I think our relationship was one of the best relationships I have had. I love Ms. Johnson and Ms. Wallace too. They make me better!